Notice how small the head is with respect to the rest of the body. We don't see this discrepancy in any of the other Sphinx statues on the trip. West theorizes that the head was re-carved at some point in antiquity. This side view is interesting from several perspectives. One: current theory holds that the face on the Sphinx is that of Cheops, the supposed builder of both the great pyramid and the Sphinx. However, some years back, John Anthony West brought a New York police face recognition expert over to have a look. 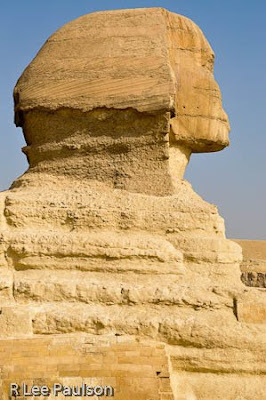 They compared the face on the Sphinx with a known bust of Cheops. Melony and I have seen the slides with all of the lines and arrows backing this up, but the conclusion, as West said, was bad news for the academics and worst news. The bad new is that the face wasn't Cheops. The worst news is that the face is that of a black man. Looking at the face in profile, one can clearly see negroid features in this face. Secondly, notice the wind erosion on the back of the neck. Notice how the erosion starts just above the chin and then goes down to just below the neck. This fits with what we know of the Sphinx, as it has been buried up to its neck in sand for the last several thousand years, only exposed for short periods of time. The face points due east, and with prevailing westerly winds, one would expect to see this kind of erosion. However, look lower on the body and notice the difference between the look of the erosion below the neck. That erosion looks very different. 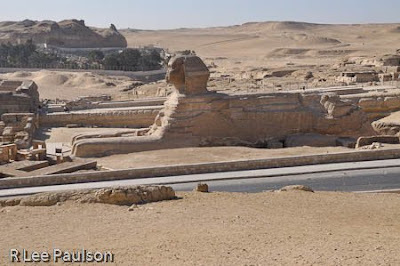 Notice that same type of erosion on the back of the Sphinx, to the right of the scaffolding, as well as on the retaining wall behind, to the left of the scaffolding. 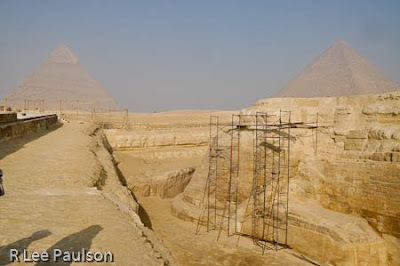 Here's a shot from the other side of the Sphinx showing how large the enclosure is. 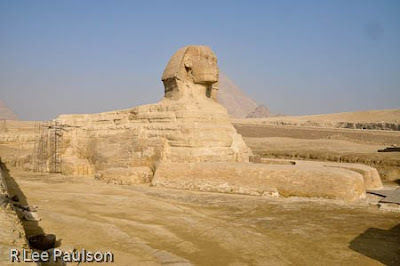 Notice all the sand and lack of vegetation behind the Sphinx. That sand stretches on for 3000 miles in a westerly direction, until it hits the Atlantic Ocean. Lots and lots of sand. The sand continually blows from the westerly direction. In only a few years, if left alone, the blowing sand buries the Sphinx right up to its head again. In order to keep the enclosure clear, as it is now, the sand must be continually cleaned away from around the Sphinx's body. 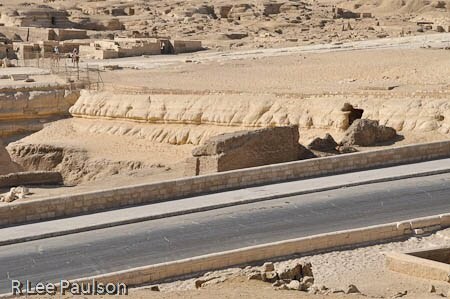 Also notice the different kind of erosion on the retaining wall behind the Sphinx and on the wall just to the left of the face, where the previous images were taken. Here's a close up of the back retaining wall. Anyone who has seen the type of erosion after a hard rainfall, on a hill lacking vegetation, will immediately notice the similarity between that type of erosion and what one sees here. This is so clearly water erosion that anyone who has ever been in the rain should be able to see it as such. However, even though this type of erosion looks completely different from the wind and sand erosion on the back of the Sphinx's neck, most mainstream Egyptologists adamantly maintain that the erosion seen here is also wind erosion. We now see why John Anthony West is so hated by theses folks. West, created a huge controversy when he maintained the obvious--we are looking at water erosion here, folks--in a TV special back in the 90's. The problem is, if West and Schwaller De Lubicz before him are right, and the evidence heavily supports them, it means that the standard theory of man's evolution must be thrown out and completely rewritten. The reason is that there has not been enough water on the Giza plateau to cause that much water erosion in the solid limestone since, well, roughly 10,000 BC. According to standard academic theory, humans were extremely primitive hunter gatherers back in 10,000 BC. They supposedly hadn't evolved much past the flint spear stage. Creating a monument of this magnitude would supposedly have been way beyond their capabilities. 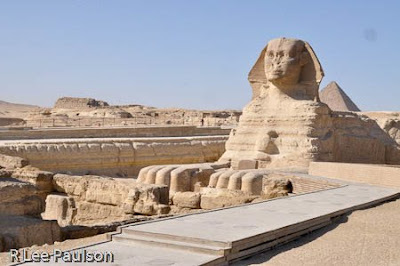 Arguments have been flying back and forth for some years, but the main piece of evidence against the wind and sand erosion theory is that for nearly all of recorded history, the Sphinx has been buried up to its head in the sand. If that is the case, then how could the wind do that kind of damage? It's a problem for the academics. I have read about West's contention for years, have attended lectures he's given on this, but it wasn't until I went to Egypt myself and saw with my own eyes that I was able to grasp the magnitude of what he and Swaller De Lubicz are saying. 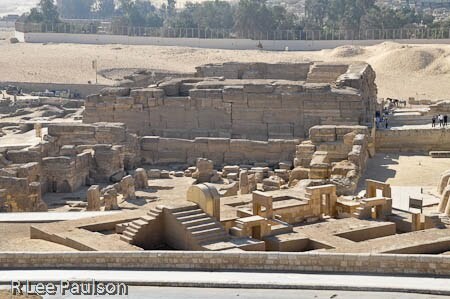 From all evidence that we have, Egypt as a civilization sprang into being, fully and complete somewhere around 3,000 BC. It then began a long period of decline. Where that civilization came from, no one knows. But if the water erosion evidence in front of us is true, and it is very hard to ignore, then someone was here long before that. Someone with sophisticated engineering and construction skills. After being there and seeing the poverty and the third world living conditions of most people in Egypt, I was more able to better understand why the Egyptian government, as well as the academics are holding on so tightly to their views. No one in the Egyptian government would dare to publicly declare that these magnificent monuments were made, or engineered by, folks other than their forefathers. It would be political suicide. Yet, the water erosion evidence, combined with the architecture of that little temple beside the Sphinx is so different from anything the Egyptians who came later did that one just has to suspect that there is much more to our history than we have been lead to believe. I've seen walls built in a similar fashion to that little temple in Mexico. I've seen photographs of similar architecture in walls built in South America. My sense is that we are all descendants of an ancient, world wide civilization that for reasons still unknown, vanished long before our recorded history began. That's about it for the Sphinx. Here is a shot of the little temple, the insides of which were shown in previous posts. One can just barely see the paws of the Sphinx to the right. The other Sphinx temple, the ruined one, is in front. But, look at the people coming out of the temple I've previously shown, on the right. Note their size and then look at the size of the limestone blocks used to construct the temple walls and one gets an idea of just how casually the ancients were able to work with such large pieces of stone. Primitive hunter gatherers? I think not. Continue on to Post 5: Sphinx area II by clicking here.